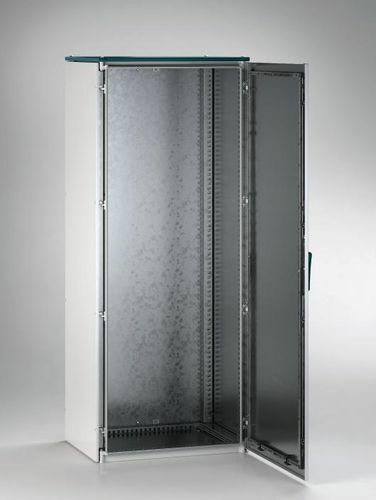 Storage cabinet / free-standing / hinged door / sheet steel - E NUX EMC - E.T.A. S.P.A. Packing - Handling - Logistics > Storage > Storage cabinet > E.T.A. S.P.A.
E NUX EMC E.T.A. S.P.A. The EC Directive 2004/108/CE works on electromagnetic harmony for tools and units that can produce/accept electromagnetic waves that lead to disturbances thereby change the precise functioning of mechanical tools in enclosures. Since EC Directive 2004/108/CE is not a channel of electromagnetic waves can handle temperaments of the directive and used as a fence of the electromagnetic waves that cultivate from the inner and outer sources. This leads to considerable humidity of the electromagnetic fields power and as a result of the interference caused to the tool. The design of the EMI-covered cabinet consisting of greater power low alloy galvanized sheet steel on each side and painted from the outside. It comprises of a strong frame, ø 3 mm lever-operated dual bar sealing system, back panel and detachable roof.